breakfast at The Nutcracker, Bandra. Hearing of my love for breakfasts, a lot of people had recommended The Nutcracker in Town as a place to check out for me. It's a vegetarian place, but you should still try it out they said, and they serve eggs too. There was a small problem though. No, not the vegetarian bit or no meat bit. The distance! 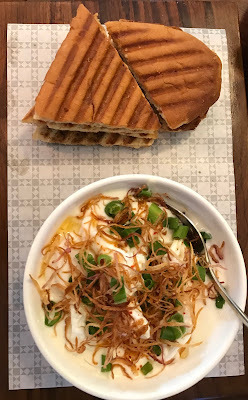 It is located in Kala Ghoda and that was too far for me to head to from Bandra just for breakfast. Specially when we have so many good cafe options around. Our current favourite here is La Folie Lab which turns out some spectacular food and coffee too. A few days back I got to know that The Nutcracker has now opened in Bandra. I was invited to try it out and I took up the offer as I was keen to do so. I am always on the lookout out for quiet places to have a good breakfast at in Bandra and where I can write, read or catch up with friends. Our reception at The Nutcracker at Bandra yesterday morning, was a bit trying to put it mildly. I had gone there with a couple of friends and we walked in happily into what looked like a cosy looking cafe. Once we settled down, we spotted a group of 11 celebrating a birthday across us and boy, were they loud or what, with absolutely no consideration for the others around. They made you want to rush out and go home and curl back into bed. Especially if you had not had your morning coffee yet. Perhaps there's merit in not hosting parties in such a small public space. Having said that, once the group left, there was a rather soothing calm that descended on to the place for the rest of out time there. I met the owner of The Nutcracker, Annie Baffna, who turned out to be a former banker and a Parsi and an eggetarian. She said that she's not eaten meat in 35 years. She told me that she had left her career to set up Nutcracker to serve the sort of food that she loves herself. 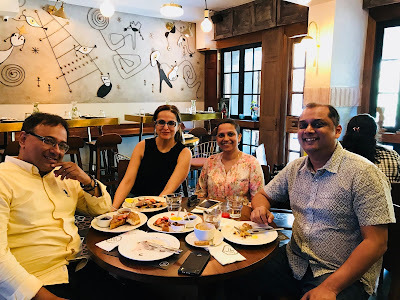 I was with two fellow Bengalis and we love our eggs as much as Parsis do so a menu based on eggs worked for us and we tasted quite a few of what was on offer. 1. 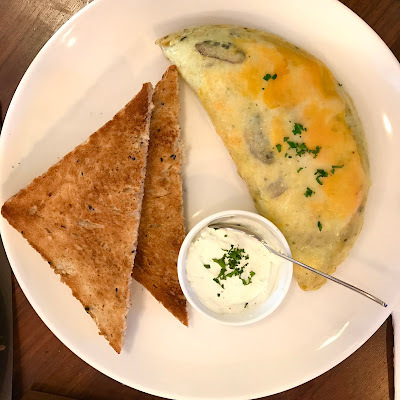 Rolled mushroom and three cheese omelet: The omelet was seasoned perfectly, was moist inside and the cheese added a lovely pop to the flavour, had just the right touch of mushrooms bits to add texture. The egg was fluffy, but not chalky or spongy as is often the case here, well folded and is possibly one of the nicest and most well balanced omelets that I've had in a cafe in Bandra. It was served with a liberal dash of cream cheese which I just love. This is the dish I would go back for here. 2. Turkish eggs: This was my other favourite and the hero of the dish was the two poached eggs in it. I would have loved softer pita (they bake all their own breads barring the pav) with it, but as a dish this would be right up an egg lover's street. If you are not too fond of garlic then you can ask them to tone that that down. I thought that the Ementhal truffle scrambled eggs showed promise. It was of that runny creamy texture that my wife, a Parsi, has taught me to love. Very few get this right, and Annie Mai (I am saying this good naturedly as mai refers to a granny which she is not) showed us how it should be done. What I could have done with, is a bit less of was the truffle oil. Like rose water in a biryani, a heavy hand on the truffle oil bottle can over-power a dish. Perhaps I'd go for a plain scrambled next time. However, truffle and scrambled eggs are a classic combination so you might want to give it a try. I just loved the bagel which it was was served with. 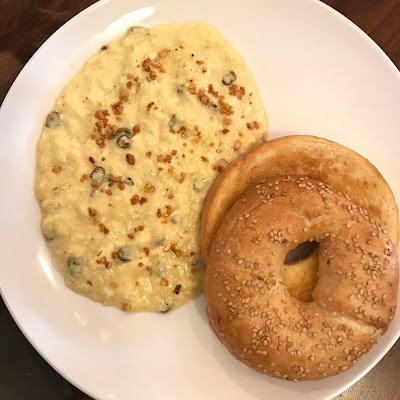 The texture was more like that of hot buttered dinner roll than a chewy bagel and in this case, that worked very well to mop up the egg with. The first was the Egg Kejriwal. I have made my peace with the fact that everyone wants to put their spin on the basic toasted slice bread, cheese, fried egg and finely chopped green chilli sprinkled dish. However, the one at Nutcracker was all about large chunks of mushroom which dominated everything else on the toast and was not up my street. The other was the Greek salad omelet. Lots of salad leaves, bites of very salted feta and a rather flat omelet, which didn't really come together well as a combination. This might work better as a Buddha bowl perhaps with the egg chopped in. After starting a with a refreshing strawberry smoothie, I had a cappuccino after breakfast. A double shot. It was definitely one of the nicest cappuccinos that I've had in Bandra. It was strong, frothy, intense and not bitter at all. Annie told me that she sources her coffee beans from suppliers in South India. With cappuccino, I tried out the classic waffle. The texture was brilliant. Mildly crisp at the edges. Soft inside but not limp. I could imagine K just loving this. I kept dipping bits of it into a tub of Nutella and nibbling on it with my coffee while I stepped out to record for my Wednesday interview with RJ Annie Marwaha on 94.3 Radio One FM Mumbai. I came back after the interview to have the chocolate chip pancake which had gone a bit cold by then and hence soft but still showed promise. As a pancake, I think I'd prefer the chocolate chip one at Smoke House Deli for its more compact texture but this has promise too. We tried the French Toast when Annie sent it across. As a genre, I am not too fond of the classic sweet French toast, but if you are, then you will be happy to know that was delightfully moist inside and had soaked in all the flavours of the goodness added to it. I left The Nutcracker with a feeling that I'll come back with the missus one day for the rolled omelet and the cappuccino and the waffle and to take a stab at the Parsi akoori on the menu, a dish she loves and is not always satisfied with what she gets in restaurants here. I think Annie would have the answer for the Bawi at home. seems to be to serve good eggs. Pun intended? Note: This is not an anonymous review. The Nutcracker at Bandra has a washroom and wifi too. It is located on the road leading to The Tajmahal Tea House and where Bru Cafe used to be and is opposite Chaayo's and across Salt Water Cafe.